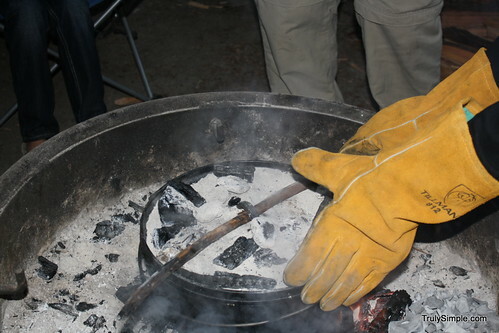 The dutch oven works by placing the coals of the fire both on top of the lid and below the dutch oven. You also need to turn both the lid and the pot regularly to avoid hot spots and to cook the food evenly. 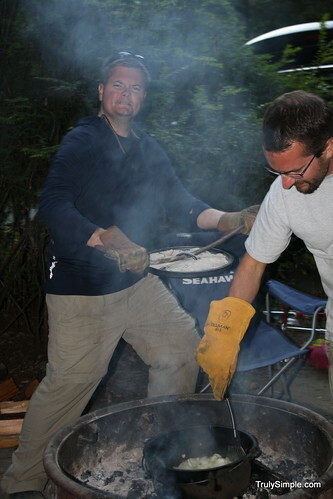 That’s the basics of the dutch oven and let me say that its very forgiving. 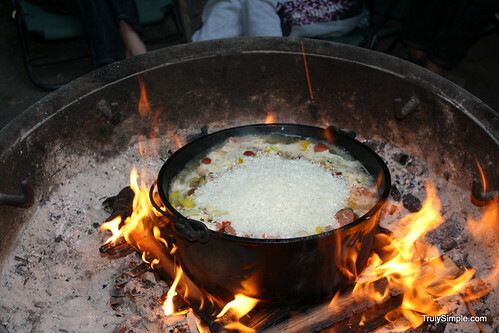 You basically throw a lot of food in there, stir it occasionally and what comes out is just delicious camping goodness. 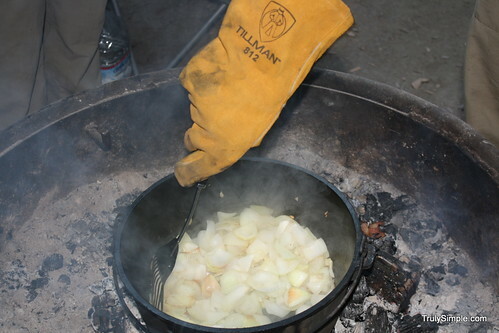 You’ll need some fire gloves to handle the dutch oven and the coals. These are my thick welding gloves. They worked just great. They also make a tool to turn and open the lid. I did not have such a tool, so a good stick made for a great lid opener. Add your bacon first. This gets all the good grease from the bacon going in the pot. Put lid on and let cook a couple minutes. Next add your garlic and onions. Put lid on and let cook a couple minutes more. Stir in your bell peppers and jalapenos. 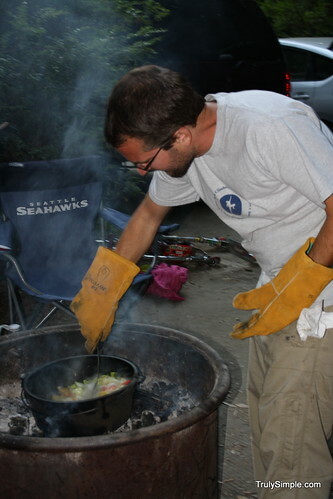 Here’s me in my awesome gloves stirring the pot. There is my great friend Brandon helping me with the lid. Having helpers lift the lid while you stir or add ingredients is helpful. Cut up the chicken into big thumb sized chunks. Cover the chicken with a good coating of the cajun spices. 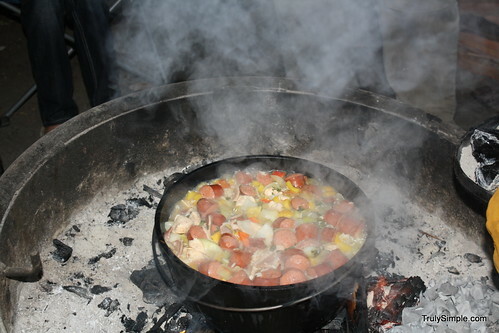 Now throw in the chicken and andouille sausage into the dutch oven and let cook for a few minutes. Next you want to fill up the oven with water until it covers what’s in the pot. Measure how much water you add because you are going to be adding rice against that measurement. Let everything cook in the water for a bit. 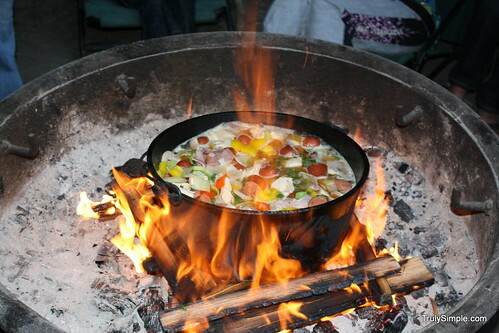 Stir and turn the dutch oven occasionally. Now add your rice. You want to add half as many cups of rice as the water you put in. So if you put in 8 cups of water, you want to add 4 cups of rice for example. Stir it up and put the lid on and sit back and wait for the magic. This turned out to be one of my most favorite meals that I’ve ever made and it turned out great on my first try. Everyone loved it, but the sausage was a bit spicy for the kids. 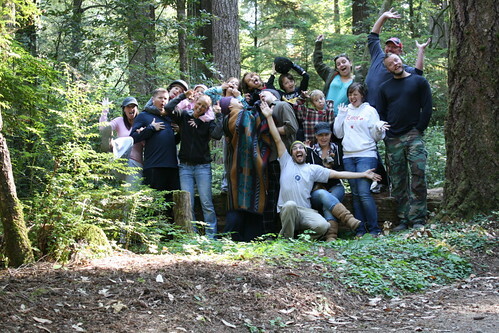 I ended up feeding 12 adults, 8 kids and some neighboring campers from this. 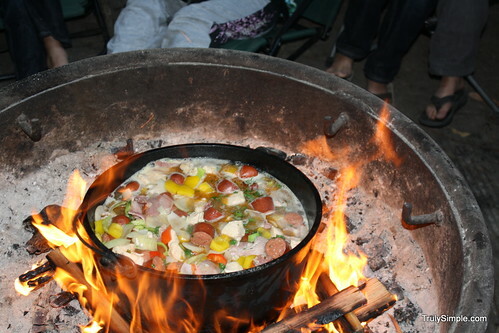 As far as camping cooking goes, I highly recommend the dutch oven. 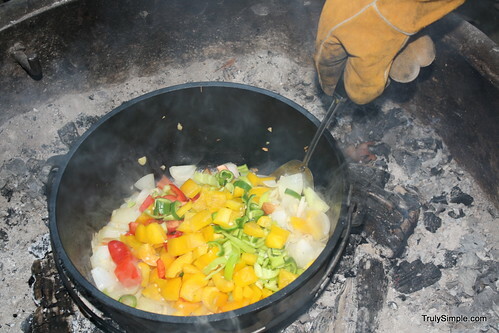 You can cook everything in one pot so it saves on the mess with cooking over a stove with a lot of different things. 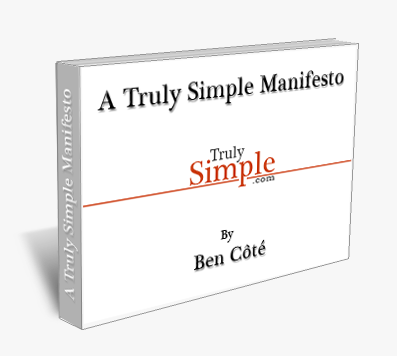 If you have a dutch oven and want to share some great recipes, please email me at ben (at) trulysimple.com. From me and all my friends, I hope you enjoy this recipe.